“My friends thought I was crazy,” recalls architect Malcolm Davis about his purchase of this turn-of-the-century home in San Francisco. But where others saw an eyesore, Davis found beautiful bones. “My friends thought I was crazy,” recalls architect Malcolm Davis about his purchase of this turn-of-thecentury home in San Francisco. It had been plagued by numerous unsympathetic remodels. 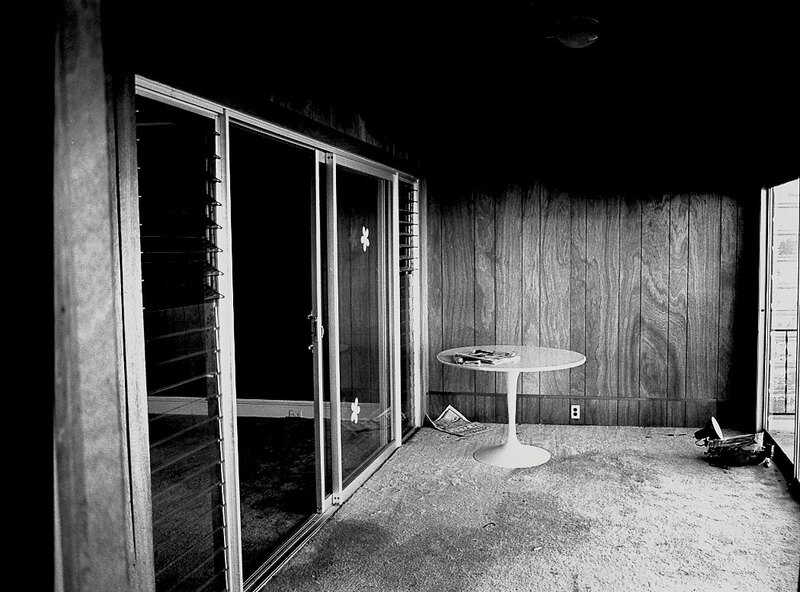 “Most prospective buyers had walked in, looked at the home in disbelief, and left.” But where others saw an eyesore, Davis found beautiful bones. He opened up the main floor, creating one large kitchen-dining-living space running from front to back. The changes are mostly on the surface, but have big impact. The view-facing wall at the rear opens through three tall French doors to a balcony off the dining area. A breakfast nook occupies an adjacent glass bay. A wide bay window captures sunshine from the south-facing front of the house, helping to balance the light. Davis used an understated palette of materials in keeping with the straightforward character of the original house, including honey-toned fir cabinetry and stainless steel counters. The refrigerator is notched into a wall full of storage compartments. Display shelves appear to float in front of a white-painted wall, which provides an effective backdrop for a collection of pitchers and bowls. 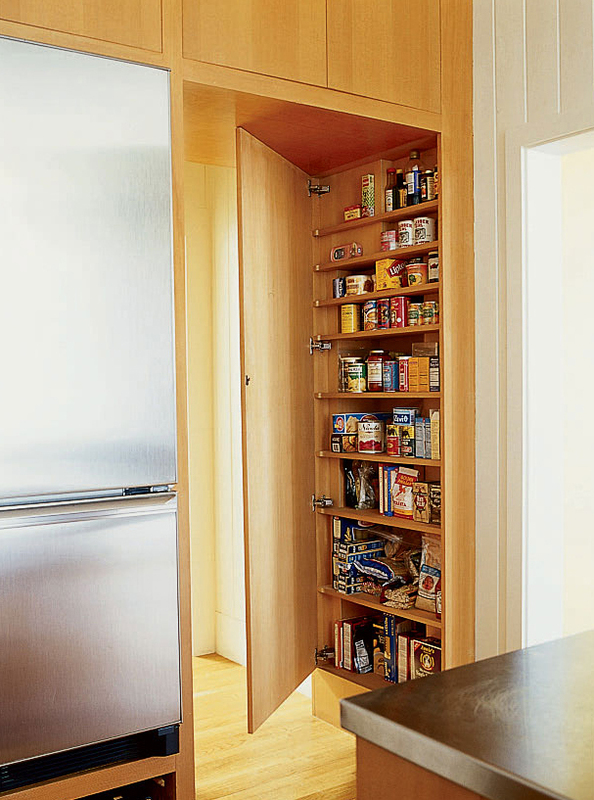 Below the refrigerator are more storage niches. Light-reflecting flat white paint covers old paneling. Floor-to-ceiling French doors open an entire wall to the small deck. Wood table and benches mixed with metal dining chairs create a relaxed look. Every inch counts in the remodeled kitchen: a shallow cabinet built into one side of the small passage beside the refrigerator functions as a pantry. Vases and other art objects provide elegant focal points. Marble backsplash and wood display shelf make the kitchen handsome enough to entertain in. 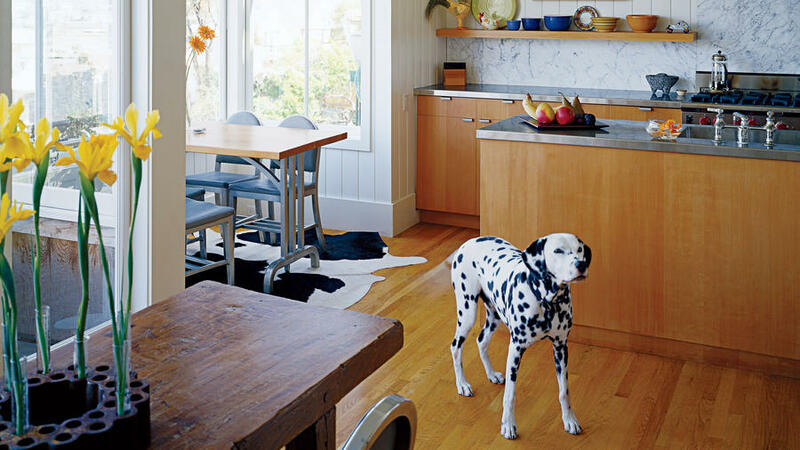 Breakfast bay acts as a daylight-catcher that brightens the rest of the kitchen. Design: Malcolm Davis Architecture, San Francisco.